Watch: Rabbi YY Jacobson’s “How Sad Would It Be If We Lost A Whole Generation” Speech And Support EMET’s Vital Work! 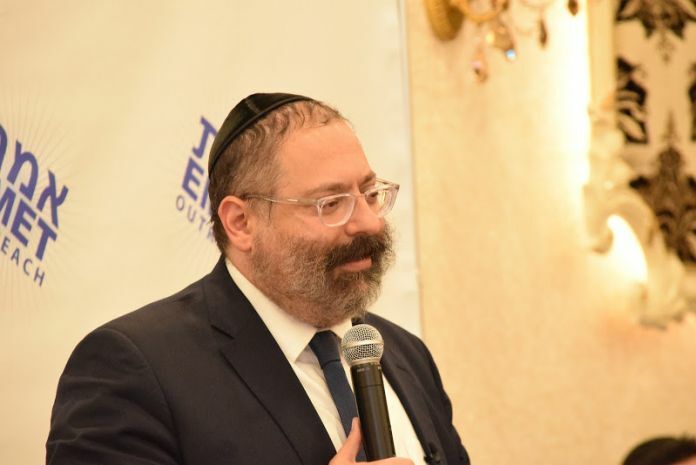 Several weeks ago, Rabbi YY Jacobson addressed an overflowing crowd of nearly 500 people at an EMET Outreach Couple’s event. One of the largest kiruv organizations in the country, EMET Outreach, has in its 15 year history, helped over 3,000 students. With 20 dedicated and dynamic staff members, EMET has divisions for beginners, advanced level, young professionals, couples, and families. Students attend classes on campus, Shabbatons, weekend retreats, trips to Poland, Arizona, LA, and Miami, special events and lectures, mother-daughter activities, and much more. Rabbi Jacobson spoke admiringly of EMET’s large couple’s division, which has over 1200 members, with a new EMET couple getting married each week. Many supporters marvel at what has become known as the “EMET Effect”. Rabbis, teachers and mentors develop personal relationships with each student, which can last a lifetime. They inspire students with the beauty of Torah and mitzvos. This beautiful approach has turned hundreds of unaffiliated students into fully Torah-observant Jews. Right now, EMET is holding a historic 36 hour Charidy campaign to transform the future. Click here to support this great cause.